Well I have to say that i give Jane Kennedy all the credit she deserves. I tried the chicken parma last night & OMG it was so tasty. Even the partners said to me "babe i am so proud of you thats the best parma i have ever had". I nearly feel to the floor as he never comments on my cooking....coz for 1 i hate cooking & 2 its always just something plan & simple. Will be making this again REAL Soon. I made the zucchini pizza base tonight and topped it with tomato sauce, chicken, onion, tomato and a little pineapple, It was sooo yummy and much easier to make then the low carb pizza base using cream cheese. Although I did use 2 eggs to make mine as the mixture wasn't quite runny enough with one egg. hiya, new to this low carb way of eating & first time poster here too. I was reading through this thread just the other day & reading some of the delish recipes posted & went out & bought both of Janes books & i now have our familys next 10 meals planned right out of just one book. We have already tried the broccoli & leek soup wich i might hadd is devine & we also tried the chicken leek & mushroom piemakins wich i thought id have trouble getting the kids to eat from the lack of pastry but to my suprise they loved it :B Her books are going to make it much easier to find soemthing we can all eat. Love this whole site too, just fab for insipration to new comers like me. i got mine from Angus & Robertson bookstore in my local shopping centre, i was lucky cause i got the only 2 that were there. ive made the broccoli & leek soup twice now & have frozen a couple of portions for when i fancy snacks or when i give kids a pasta bake or something like that. Ive been having about 200mls before my dinner, it fills me so i dont over eat when i serve the main meal. **phew** hubby made Janes Peri Peri Chicken tonight & wow it was spicy but not blow your head off spicy just be warned those who dont like it hot. Sounds gorgeous! Do you use both of Jane's books equally, or are you finding one is becoming a favourite? If so, which? Ten golden starts to the cook, BTW! Ozgal weve only been using the OMG I CAN EAT THAT book so far because its the one the kids keep chosing from, im finiding my mr12 will eat more if i let him chose the menu, weve had the beef strog twice in 2 weeks & he reckons its his fave of all time now & we MUST have it at least once a week lol. I will have to check kindle store to see if they have the first book! These recipes look great, I've seen Jane's book before and but wasn't tempted enough to buy, now I am. I just love her books. Her moussaka recipe is my fave. I got both of my books online at Borders, they were a bit cheaper plus I got 10 percent off and free delivery so didn`t have to pay for postage. 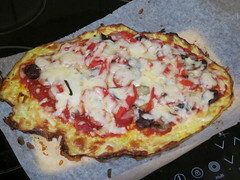 I made her pizza for lunch yesterday-I put different toppings on it (a tiny bit of onion, roasted red capsicum, olives, cabanossi and mushrooms) but used the base recipe. It was so good. Looks good What does she use for the base? Ah sounds like a similar recipe to Jamies AKA oopsie rolls and cauliflower pizza base. What was the zucchini base like? If I didn't make it myself I wouldn't have believed it was made out of zucchini. I peeled the zucchini first before grating, but it tasted really nice and a lot like a thin & crispy style base once it browned up. I can't compare it to a cauli base as I haven't tried one of those yet, but it was really quick to whip up.